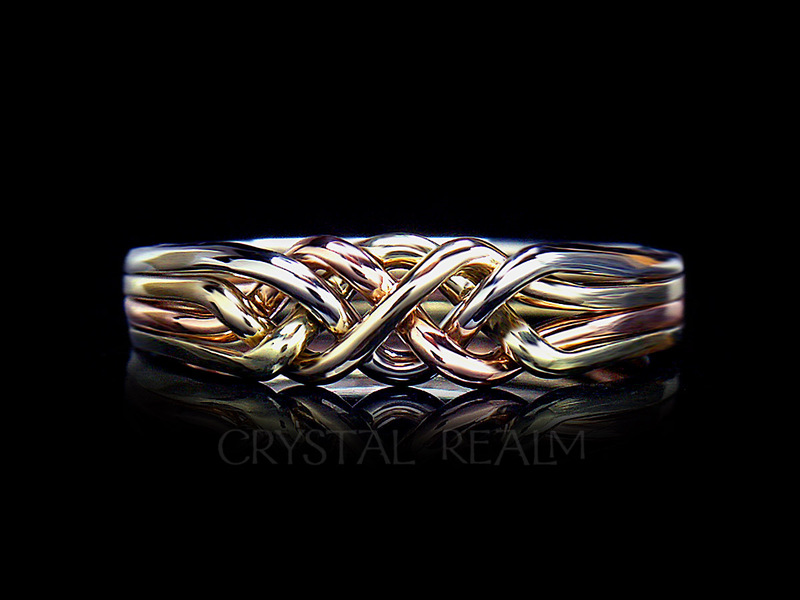 We offer hand-woven puzzle rings, which are unique in the market, as most puzzle rings are cast from molds. 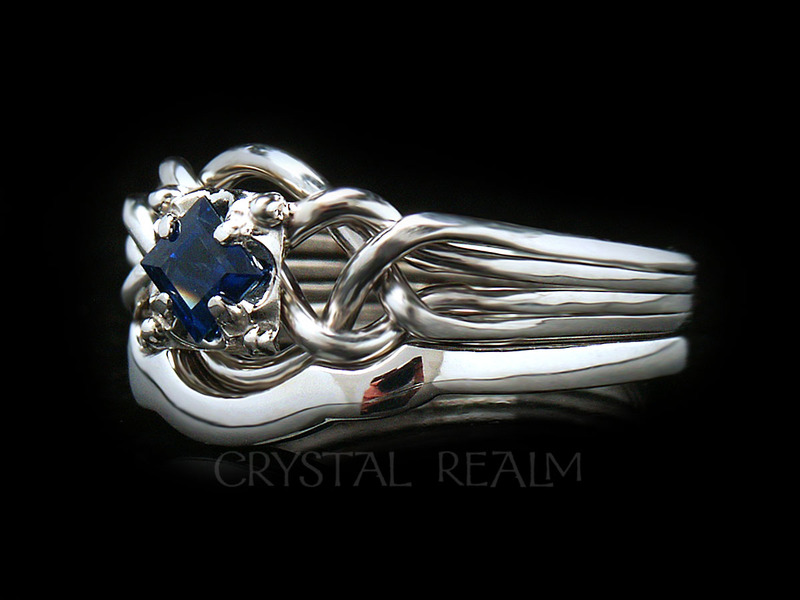 Our puzzle ring maker supplies Crystal Realm exclusively, and we are very proud to showcase his skill in every ring. We offer video instructions, so you can learn to put your puzzle ring together. Then you can amaze your friends with one of the most unique wedding or engagement rings in the world! 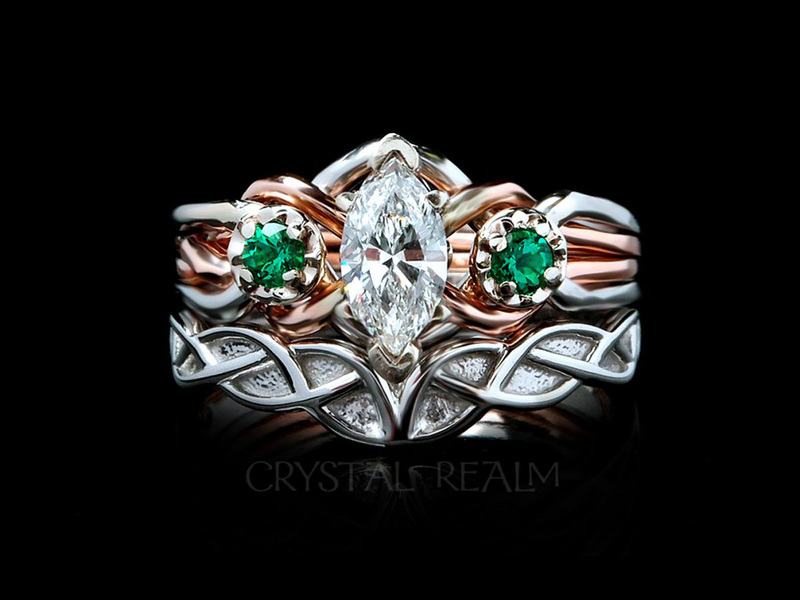 Then we pair your puzzle engagement ring, if you wish, with a custom fit shadow band or an Irish claddagh band or a Renaissance reproduction poesy ring. 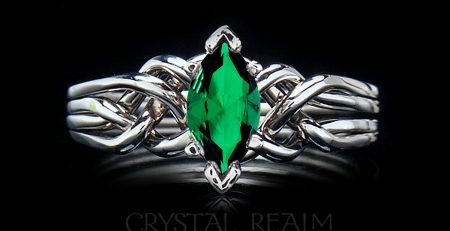 Sterling silver; 14K yellow, rose, or white gold; four colors of 14K gold: white, yellow, rose, green; palladium, and platinum. lab-created colored gemstones from amethyst to zircon. 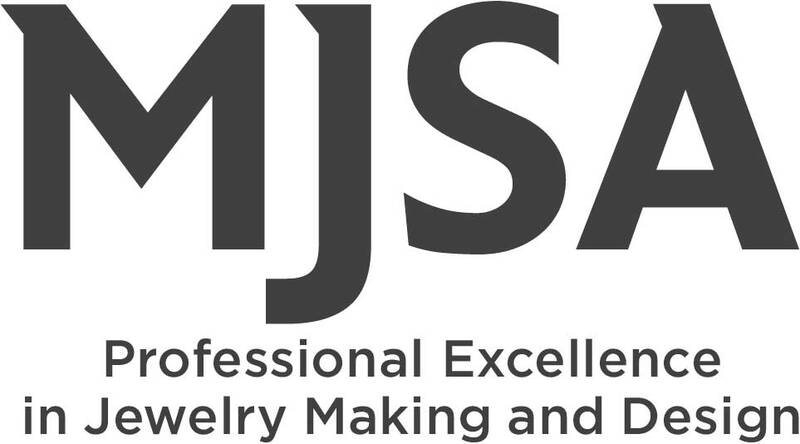 For shapes, we only offer marquise, princess cut (square) or round stones, though, because we like to use “bullet-proof” settings. We don’t want your stone falling out. 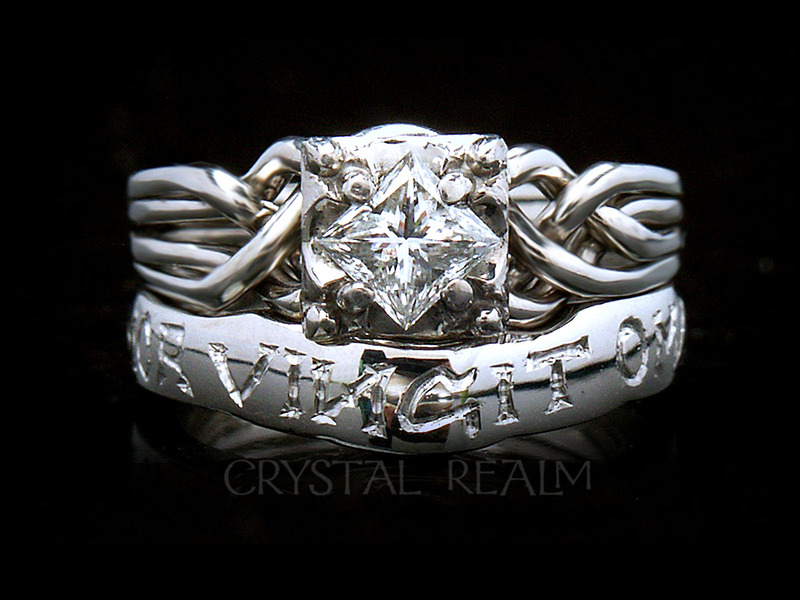 Our Guinevere, Avalon, and Athena rings bear stone settings that do not tend to get bent prongs or lose stones. 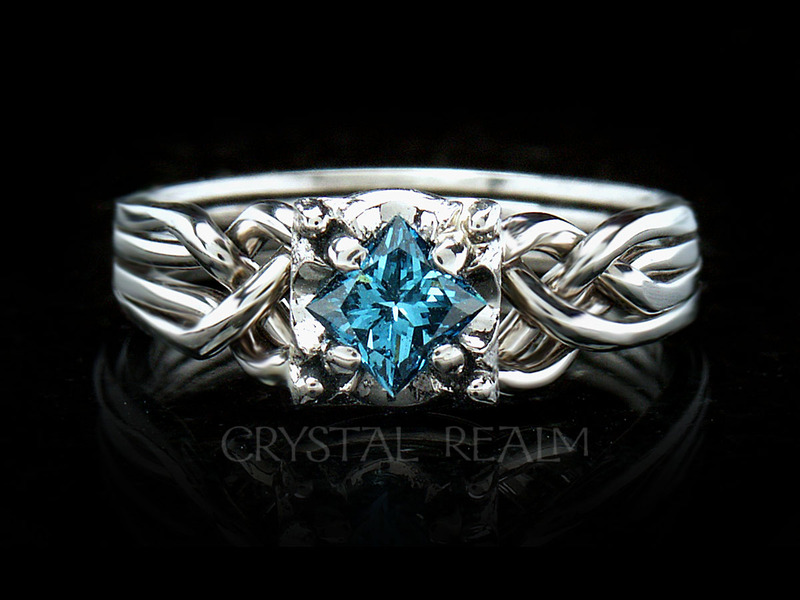 At right is a Guinevere puzzle ring with a one-half carat blue diamond. 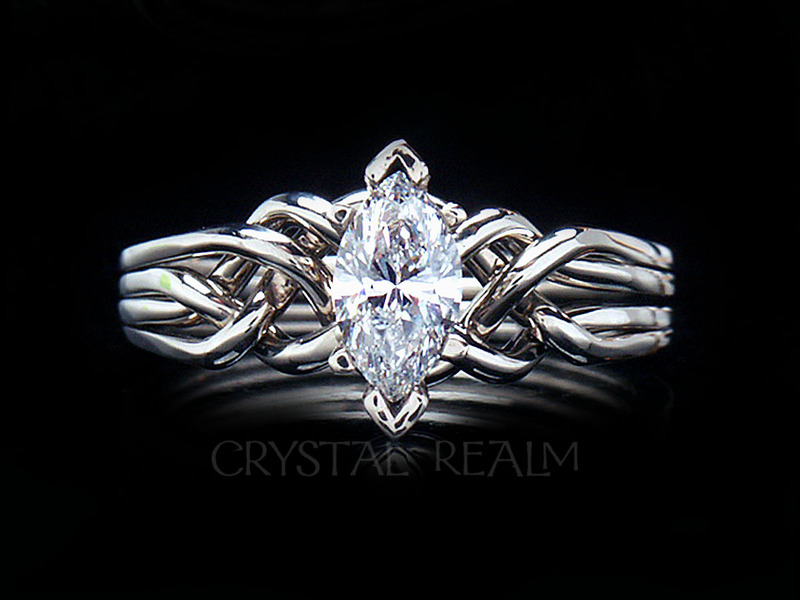 Our marquise setting is a tad trickier, because it has pointed ends, and it holds the stone up off the ring. This means, it can get caught on things. So once in a long while, a customer will have a bent prong. Or even more occasionally, a stone will be lost. We recommend always insuring your puzzle ring, and we also recommend that you select one of our more bullet-proof settings. But if you are like me (Mandira), you will insist that the marquise is the only one for you, and you will be as careful as possible when you wear it. Why do I give you this information? Because we are into full disclosure and transparency, and we want you to be able to make the most educated decision possible when you choose an engagement ring. 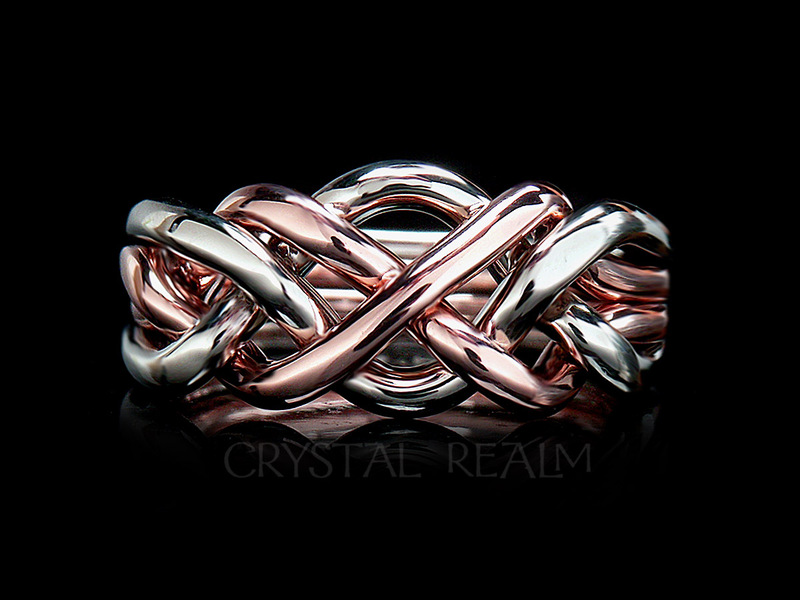 A Cambridge four band puzzle ring in ultra-heavy weight is shown in 14k white gold. Notice the slightly elongated look to this puzzle ring – it is a hand-woven ring like our other puzzle rings, but it has this special look. 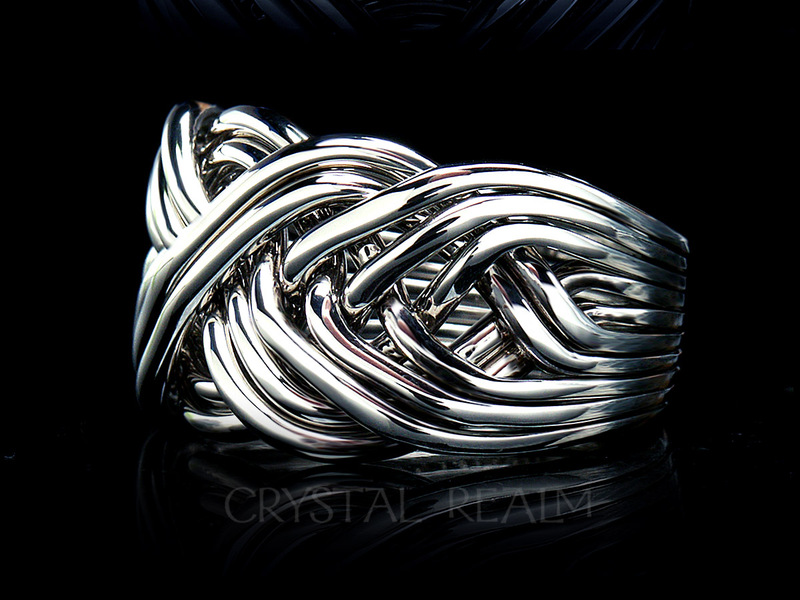 A three-quarter view of a ten band puzzle ring shown in 14K white gold. 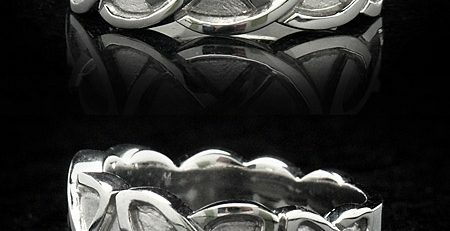 You may choose palladium on the same page or contact us for other metals. 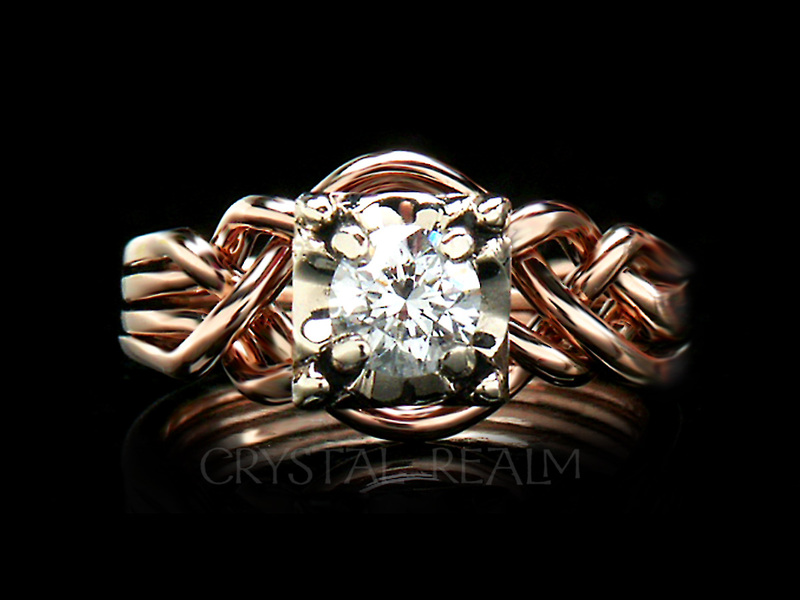 We are best known for our puzzle engagement rings. 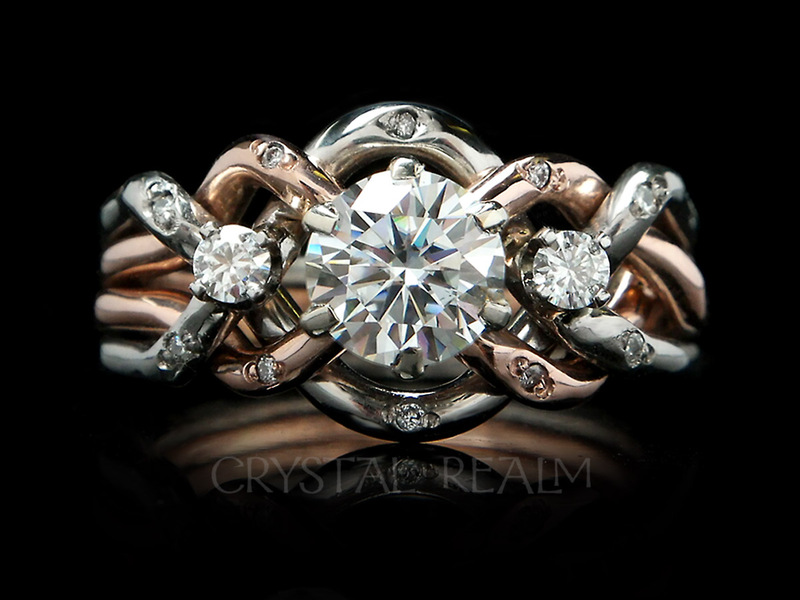 Here is a four band puzzle ring bearing a marquise diamond. 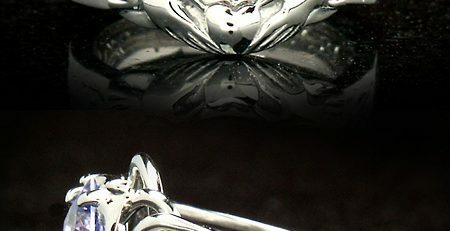 Made of palladium, a naturally white, platinum-family metal, this ring still comes apart and goes back together, even with the stone. 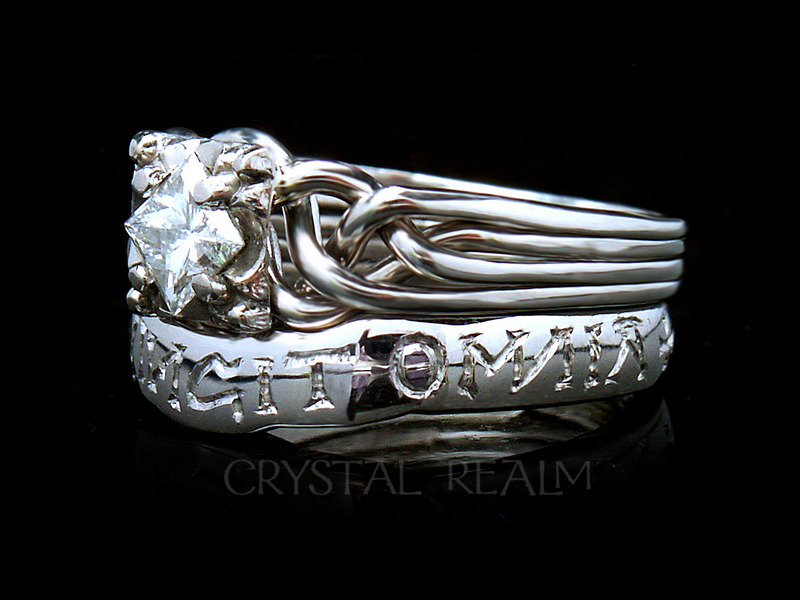 genuine Irish claddagh wedding ring. 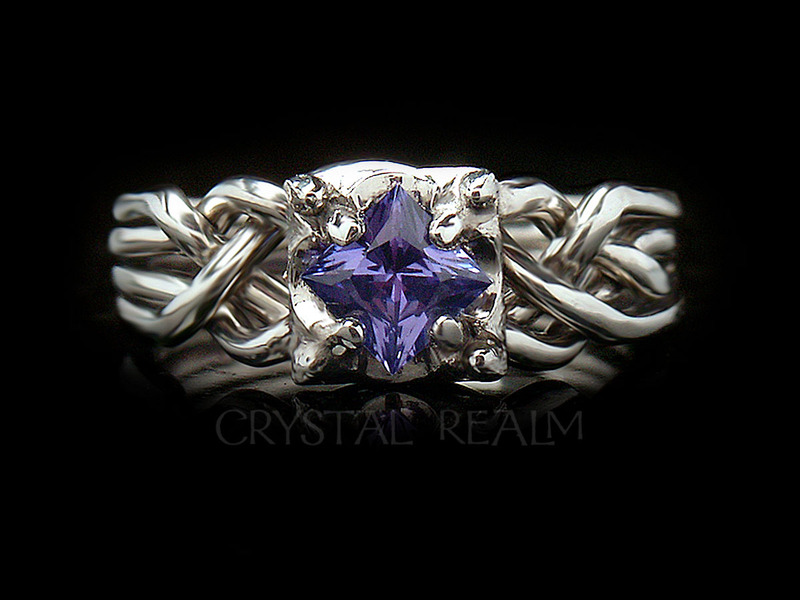 Genuine tanzanite four band puzzle ring in palladium. 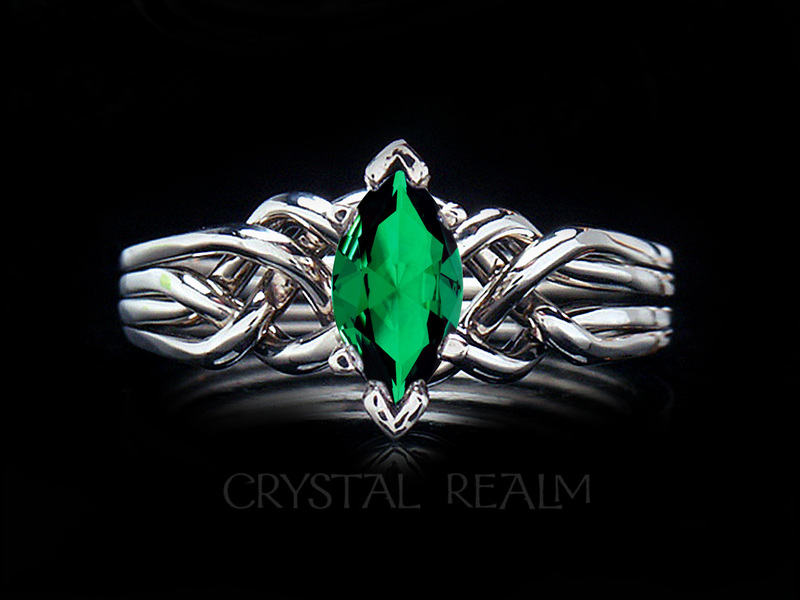 This ring is hand-woven for an original puzzle ring that is exclusive to Crystal Realm, as are all of our rings. Now for some colored metals. We have 14k gold puzzle rings in white, yellow, and rose gold; combinations of two colors, and even some in four colors of 14k gold. You can select gold and palladium, gold and platinum, or any combination of gold colors you love. 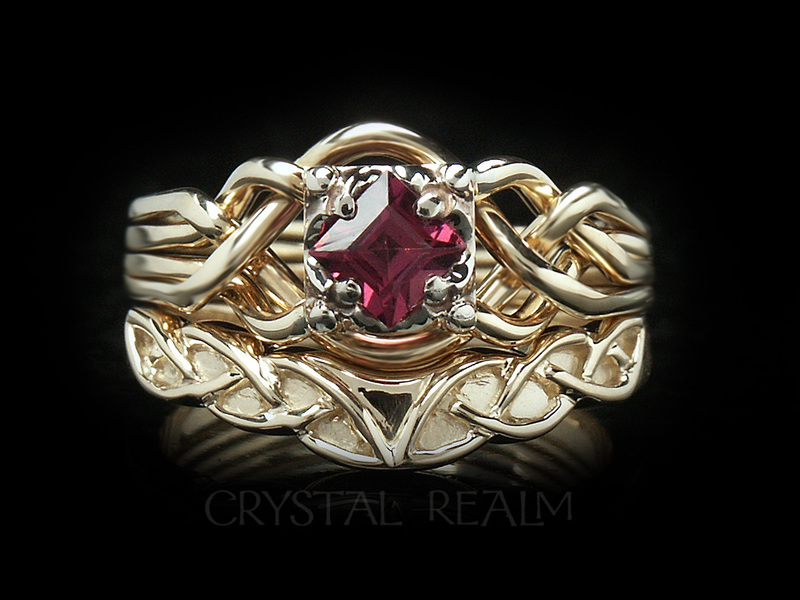 Guinevere puzzle ring with 4mm rhodolite garnet in 14K yellow gold with Celtic shadow wedding band. 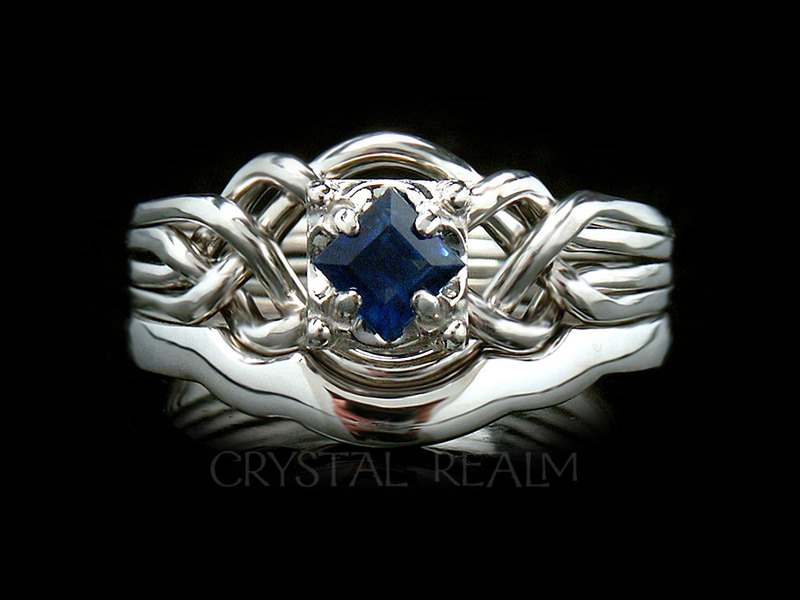 This is a totally hand-crafted set: the puzzle ring is hand woven, and the shadow band is made from a hand carved wax. Your set will be a one-off original! 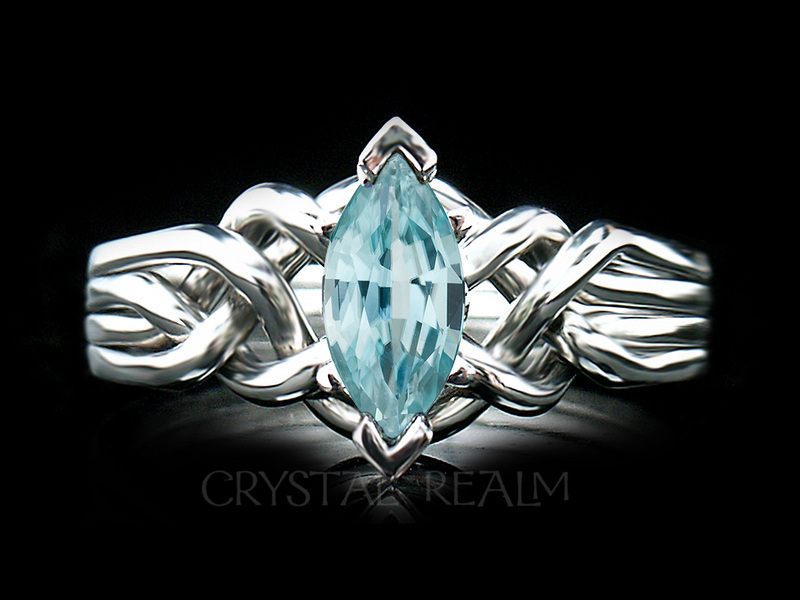 Four band, hand woven women’s puzzle ring with marquise rainforest topaz set in palladium. We love this stone with any metal. The color really pops! 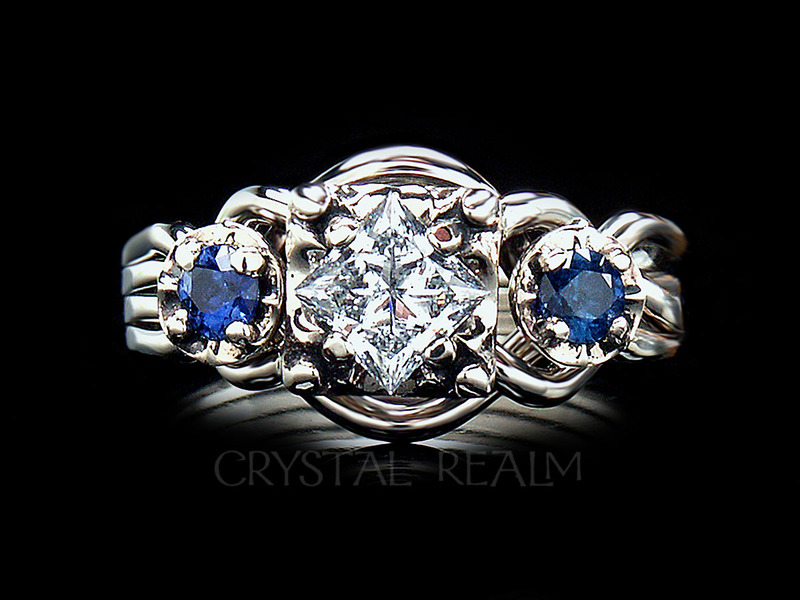 Guinevere four band puzzle ring with a one-half carat diamond flanked by two five-point sapphire accents. 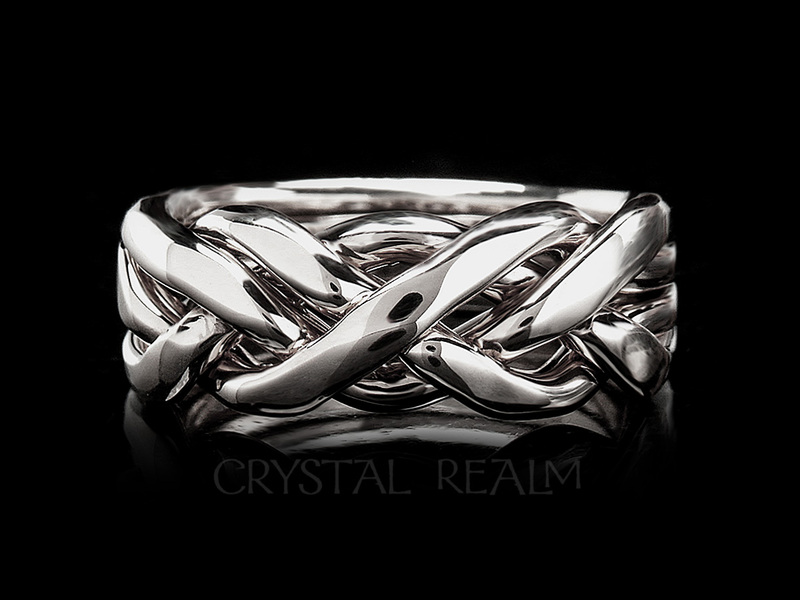 The ring is hand-woven, and it may have an open weave, as shown here, or a standard or tight weave, depending upon how wide you want your ring or what kind of wedding ring you want to wear with it. 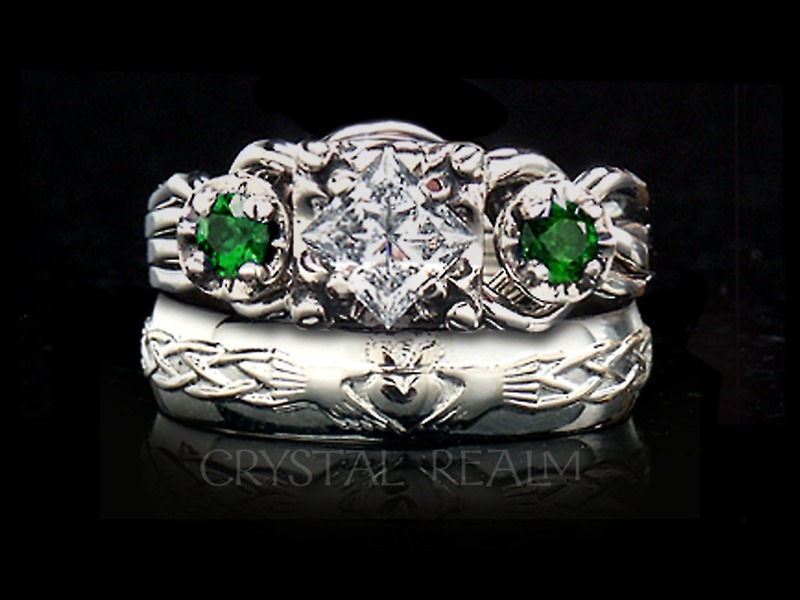 Celtic bridal set with a marquise diamond and emerald puzzle ring and Celtic wedding band. 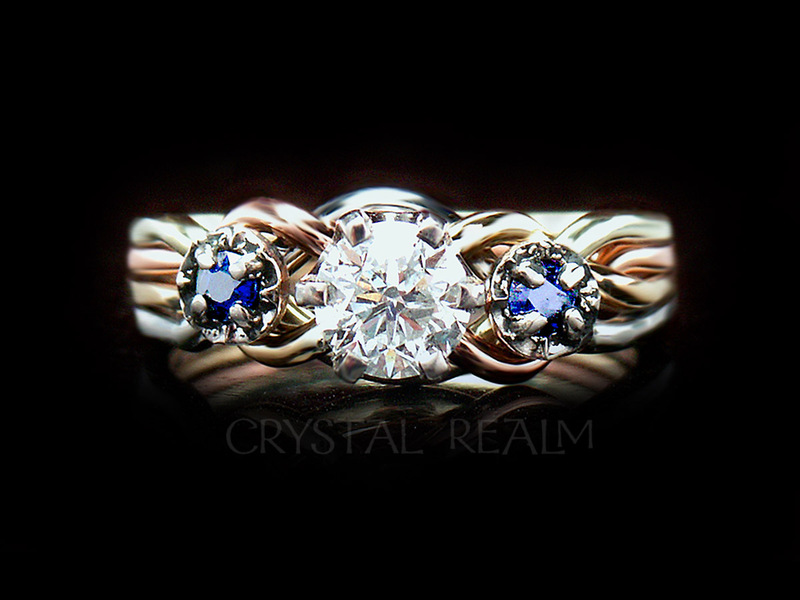 We pair lots of our rings with shadow bands that mate with the puzzle ring perfectly. 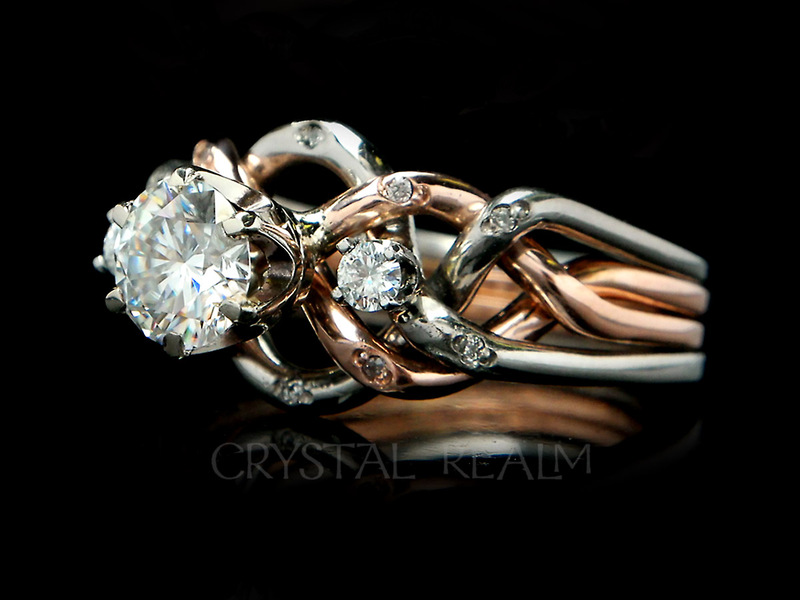 This set is shown in 14k rose gold and palladium.